2018 recorded revolutionary business software advancements, and caused a turnover of brave corporate decisions and new expectations. One thing, however, hasn’t changed at all – the need to optimize resources in the service of maximal output. Businesses of today no longer have the luxury of refusing customers due to unavailable services, and this fact makes the possession of a reliable ERP (enterprise resource planning) solution an imperative condition for success. ERP software tools are commonly used for documenting resources and automating workflows and entries, and aligning in such way the value chains of corporate projects, as well as all critical processes. Why are so many companies interested in ERP software solutions? Available either as independent applications or modules incorporated in compact accounting suites, ERP systems entail a reasonable investment that cuts overhead costs and enables day-to-day automation. Once installed, ERP software gives you the clear picture of how you should allocate resources, simplifies regulatory compliance, and improves regulatory decisions. 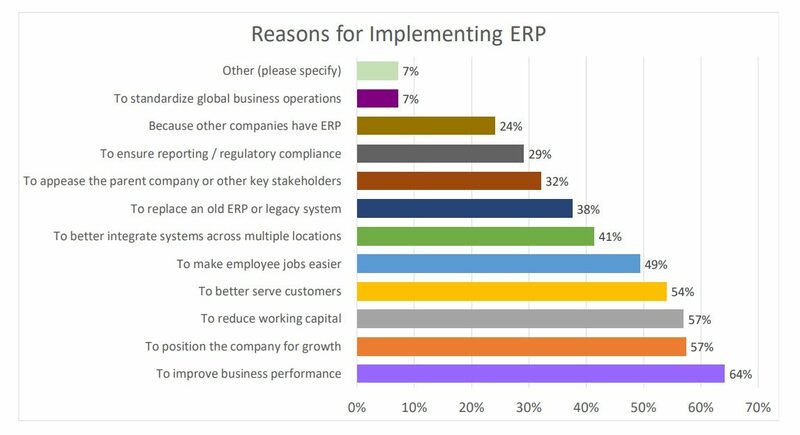 According to Panorama Consulting’s 2018 report on the application of ERP software, almost 38% of current users have already replaced their legacy systems with ERP ones, while nearly 64% experienced improved business performance and employee satisfaction. ERP tools are also known for their undeniable contribution to companies’ financial management know-how, as they usually provide payroll automation, billing, expense monitoring, sales and supply chain governance, and CRM capabilities. The user has no obstacles integrating them into tax and capital management operations, and touts them (in nearly 90% of the cases!) as primary assets for warehouse issue regulations. Thanks to the overall presence and dominant role in corporate life, ERP tools are expected to contribute with an impressive 30% growth to the total market revenue as soon as 2020. Therefore, 2019 is the right year to pull assets together and bring the ERP question on the table. With an astonishing variety of online apps and complex resourcing machines, you’ll need a clear list of priorities and expectations, and our list of 20 best ERP software tools of 2019 is a good place to start taking notes. 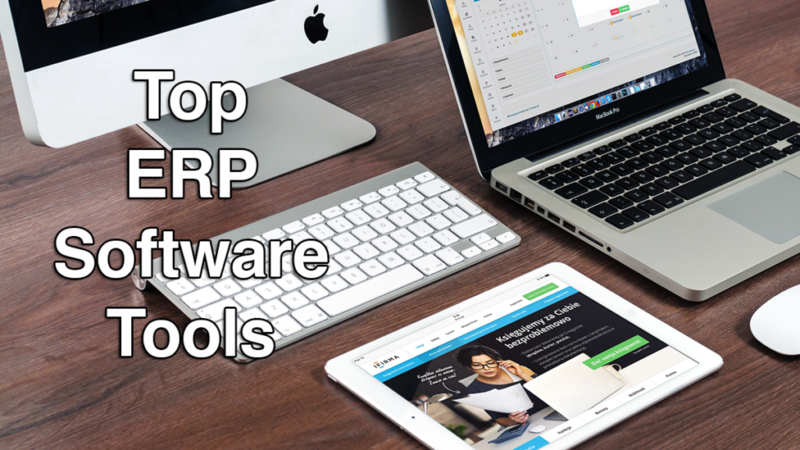 What are the 20 best ERP software tools of 2019? NetSuite is one of those omnichannel ERP systems you may never use or need, but will most certainly refer to as the pioneer of several best resourcing practices. With a guaranteed position on leading lists and classifications, and a number of industry awards, NetSuite offers solutions to businesses of all industries and backgrounds, and is just as adept in detail as necessary to define resource management at its best. To support such reputation, NetSuite ERP will streamline mission-critical processes, leaving enough space for makeover and adjustment to the specific requirements of your business. It offers advanced financials, resource management, and supply chain control to keep your steady for upcoming market opportunities. At the same time, you will be using an innovative technology that adopts trends seamlessly, ensuring that you’re always a step ahead of your competitors. If you’d like to see the software in action the vendor provides a great free demo showcasing all the key features. You can easily sign up for NetSuite ERP free demo here. NetSuite ERP consists of several in-suite modules you’d obtain against a single, fixed fee. These are: Financials, Order Management, Production Management, Supply Chain Management, Warehouse & Fulfillment, Procurement, and the unique Human Capital Management that maximizes the input of your most valuable resource – your personnel. To make matters even better, NetSuite ERP also integrates with a number of leading industry solutions to facilitate data migration. What is unique about NetSuite ERP? The reputation of a financial management leader. Founded in 1998, NetSuite is one of the most experienced players in the software development industry. They are trusted by all sorts of businesses for best-in-class accounting products that help them monitor their business’ financial health. With these said, you can be confident that they will provide you with no less than high-quality products that do exactly what you need them to do. End-to-end visibility of your supply chain. NetSuite ERP offers comprehensive features that tackle the different aspects of your operations. Whether you want to optimize how you delegate workload, automate stock management, or organize your procurement purchasing efforts, this platform can do it all in a single platform. With this, you can get end-to-end visibility of your supply chain effortlessly. Efficient Transaction Processing. Aside from simplifying inventory management, content management, production management, and other back-office tasks, NetSuite ERP is also capable of processing transactions in-platform. It is equipped with an order and billing management module that allows you to perform various financial requirements. This way, you won’t need to invest in a separate platform to bill clients, monitor profit, and the like. Accurate financial forecasting. Setting reasonable financial targets can be quite difficult, especially if you have to do the calculations manually. To simplify the process, NetSuite ERP offers a financial modeling engine that lets you run “what if” scenarios. This way, you get a more accurate analysis of actual and projected results with ease . Employee management. The materials and equipment you use for your operations are not your only resources; your employees are too so you should make sure you are handling them effectively. This is what NetSuite aims to do by providing their users with robust human capital management tools. Using this tool, you can monitor productivity by managing workloads and distributing tasks efficiently. Sage 100 ERP is another compact finance management & consulting provider targeted towards small and developing businesses. It is a worthwhile mention on our list of best ERP software tools. For a TCO fairly lower than with similar end-to-end applications, Sage 100 will supply you with an up-to-date architecture, and a variety distribution and manufacturing features that can be tweaked to meet the needs of any industry. In a fashion similar to NetSuite ERP, Sage 100 distributes functionality in several modules, among which financial management, business intelligence, CRM, manufacturing & distribution, sales, inventory, human resources, eBusiness and many more. A variety of accounting and tax management features will also be in place to ensure neat customer management and product line stability, which is a goal Sage also supports with document management and over 100 integrated payment gateways. What is unique about Sage 100 ERP? All-in-one financial management solution. Sage 100 ERP consists of several financial modules to cover for as many of your day-to-day operations as possible. These modules include financial management, sales management, tax administration, integrated payment processing, inventory & warehouse management, manufacturing & distribution, document management, CRM, HR, and many more. Flexible deployment. Sage 100 ERP is an easy-to-use and comprehensive enterprise planning system whose implementation is highly-modularized, and allows companies to purchase or deploy only the functionalities they need. Full coverage for your budgeting needs. This system allows you to store historical budgets in all of your records, or create such independently when planning expenses for upcoming fiscal periods. As a result, you get to save valuable time, and cut expenses for at least a half of what traditional ERP systems require. In-depth and customizable financial statements. Sage 100 ERP is also a system within which the user can create financial statements, and choose between a variety of pre-built and pre-defined templates to make financial operations more industry-specific. Another important advantage is that in its current form, Sage 100 ERP support remote access and backs up data and operation overnight. Seamless connection to Sage Data Cloud. Once you purchase the product, you will be able to connect it to your Sage Data Cloud, and easily import/export information from the two. This native integration also makes it possible to connect Sage 100 ERP to a variety of Web and mobile services and applications, and have all of your data secured in a single cloud location. ECount ERP is a fully integrated solution that leverages the power of sales management, production management, accounting, and inventory monitoring in one convenient interface. Web-based and accessible on any device, this software can provide all the tools you require to streamline your entire operations. With it, you can expedite processes, reduce the risk of human errors, as well as ensure that your data is easily accessible to you and your staff members. On top of that, this software has a low maintenance cost as the vendor provides regular updates without any additional fees. Moreover, another thing to note about ECount ERP is its competitive pricing plans which can be acquired for only $55 a month. What is unique about ECount ERP? An extensive list of useful features. It can be expensive to invest in multiple business at once, especially if you own a small company with limited financial resources. With ECount ERP, you can have all the essential business systems in one package. Whether you need accounting tools, inventory management options, or purchasing order features, This platform supports it so you can optimize your operations without having to spend a lot of money. A manufacturing software component. One of the most difficult things about the manufacturing process is getting a 360-view of your production process, expenses, and income. Using the manufacturing software component of this product, you can have all the data you need right at your fingertips. This way, you can accurately manage sales, purchase requests, and the like. A compact sales module. As your business grows, it will become more overwhelming to keep tabs on sales activities. With ECount ERP’s end-to-end sales management module, you can get accurate reports on how much you are making on a daily basis. Moreover, because this module also supports billing and invoicing options, you can collect sales information and feed it to your database automatically. Groupware system. Make sure that your teams are collaborating as smoothly as possible using ECount ERP’s groupware system. This feature allows you and your staff members connected at all times via online boards, in-platform chat, and other communication options. Moreover, this is equipped with task management capabilities that let you efficiently manage the workload for each employee. Reliable support. No matter how advanced a platform may be, it is still possible for you to encounter technical difficulties. This is why ECount ERP has team of knowledgeable and experienced professionals, ready to answer your questions 24/7 via email and phone. Business One is German SAP’s flagship ERP product known for powerful automation of key financial processes in small and mid-market companies. Definitely a product deserving to be mentioned on our list of top 20 ER software tools. A total of 17 functional productivity components will be in place for users to manage processes independently, or integrate those within each other upon need. Such unobstructed flow of information will also ease inventory management, production planning and control, and instant sales reporting. The Business One platform is supported by digitized SAP HANA, a special version of the product that powers application data in-memory, speeds up transactions, and provides you with a streamlined and easy-to-manage IT landscape. The same as other SAP products, Business One is offered in quote-based annual licenses, so that it meets the specific needs of the prospective user. What is unique about SAP Business One? Bookkeeping & Financial management functionalities. Like the other products on this list, SAP Business One simplifies operations for you by consolidating all the tools you need to tackle your day-to-day work. However, what sets this apart is its robust bookkeeping and financial management functionalities. Not only do they help you keep tabs on your business’ financial standing; it also records the data and organizes it into insightful reports to help you reinforce decision-making. Lead generation. On top of financial management capabilities, another thing to note about SAP Business One is its best-in-class CRM module. Using this, you can nurture your existing clients and accelerate conversions. Moreover, it provides you with functionalities that will help you generate more potential customers. Automated procurement & order management. Purchasing supplies and procuring equipment are not easy. This is why SAP Business One offers automation tools that can speed up and streamline the entire process. From starting your transactions to processing the payments, this software solution can do it all. SAP HANA. SAP HANA is a special platform designed to support Business One and power the application of data in-memory, accelerate transactions, and to let you work in a streamlined and easy-to-manage IT landscape. Flexible deployment. With SAP Business One, users get to choose whether they want to use this system in cloud or deploy it on premise. In both cases, installation and full set up take no more than 2-8 weeks. Oracle’s E-Business Suite (commonly referred to as EB Suite) comprises of several prominent Oracle applications crafted for compact finance management. What was originally a sole accounting system is now empowered to cover multiple functionality modules, including SCM, HRMS, Project, Procurement, and CRM. The core of the suite is none other than its enterprise resource planning capability that uses Oracle’s one-of-a-kind relational database management technology, which means that you can use a single tool to assemble all resource information, and manage procure-to-pay and order-to-cash processes from the same dashboard. A separate module is dedicated to project resources, and access to data is governed with a variety of roles and permissions. What is unique about Oracle E-Business Suite? Supply chain management. To integrate and automate all key supply chain processes from manufacturing to fulfillment, Oracle E-business will provide you with manufacturing control tools, asset lifecycle management, value chain planning, order orchestration and fulfillment, and business intelligence features. Value chain planning. Value chain planning is an important component of the E-Business suite built on a common foundation with other important Oracle products, such as JD Edwards EnterpriseOne. It offers an advanced planning command center, global order promising, inventory optimization, real-time operations and sales planning, collaborative planning, demand signal repository, rapid planning, and much more. Advanced procurement. If looking to cut supply management costs even more, Oracle E-Business will give you a suite of advanced applications that reduce the spending on products/services, and drive policy compliance. These are: iProcurement, iSupplier portal, Procurement contacts, Oracle Contract Lifecycle, Oracle Spend Analytics, Oracle Spend Classification, Purchasing management, and many more. Project portfolio management. Another tool that makes Oracle’s business suite unique is the Project portfolio management kit, which is offered to support the full lifecycle of project and portfolio management with a single, accurate view of all project-related activities. It contains: project analytics, project billing, costing, collaboration, contracts, and end-to-end task management. Human capital management. Appreciating the value of your personnel as the main resource and moving engine of your operations, Oracle also designed a HCM suite, and equipped it with workforce service delivery and management, HR analytics, and talent management capabilities. As developers like to put it, Infor VISUAL brings order to your orders, and it is exactly its capacity to unveil a seemingly complex manufacturing process that makes it as popular as it is. With lots of advanced features and functionalities, Visual makes it possible to have the impact of each order visible at a glance, be that you’re interested in speed, efficiency, price, or eventual bottlenecks and delays. In such way, Visual assists manufacturers to produce and deliver quality products in time, while also providing them with a unique, off-the-box set of inventory controls (test procedures, adherence to preferred standards, closed-loop communication, industry-specific certification, and more). Powered by a SQL server, Infor Visual is flexible enough to support the development of any business, and it is thus usable for cross-selling, consolidation, or maintenance of multiple retail locations. What is unique about Infor VISUAL? Efficient quality controls. Infor VISUAL allows users to enforce a variety of test procedures for their manufacturing and supply chains, ensure adherence to prescribe regulations and standards, reduce scrap, and inspect communication and documentation. On-time product delivery. The system increase production throughput and enhance customer satisfaction. For the purpose, it offers a patented performance scheduler where users can check their delivery dates, secure shop floor capacities, and create a variety of ‘what if’ scenarios. Full, SQL-powered scalability. Infor VISUAL is powered by SQL servers and Oracle databases, which means that its database infrastructure is scalable, and offers users all-inclusive, multi-entity, multi-site, and multi-currency capabilities. Hybrid solution. VISUAL works with a Microsoft Windows framework and Infor 10x tech stack, thanks to which it enables external cloud automation for global deployment and mobility. This means that you can complete tasks, monitor performance, and access data from any device and location. Configuration management. Infor VISUAL offers a powerful rule-based configurator for employees to control products, display prices, upselling options, and incompatible configurations. An engineering master is created automatically to reduce lead time and to eliminate manual errors. Sage Intacct is known to close a variety of functionality gaps in the financial management industry, with its ERP capacity often being in the focus of attention. What makes this Sage system a desirable addition in any corporate environment is the processing of high value metrics and detailed insights, and the capacity to serve a number of industries other than manufacturing (accounting, franchise, healthcare, hospitality, services, wholesale, and nonprofit). Using Sage Intacct will transform your ERP experience in many different ways, starting with its multi-dimensional general ledger built for growth, and coming down to its end-to-end scalability that will keep it in use once your customer database doubles. Its robust multi-tenant foundation is also an important advantage, having in mind all the money you’d save on learning it, maintaining it, or integrating it with other solutions. A friendly interface. Easy-to-navigate, the Sage Intacct dashboard can also be customized, creating shortcuts to most common functions. The system allows the user to only use applications that are needed, eliminating time-wasting systems and boosting productivity. An impeccable reputation. Sage Intacct is recognized by AICPA as their top provider of financial-related applications to CPAs. As a result, this partnership allowed professionals in the accounting field to make better financial decisions based on key figures and statistics. All core accounting capabilities packed on a single dashboard. Sage Intacct has a general ledger feature that makes data entry smoother and faster. Using this, you can get a good idea of your profit margins and operational costs and cross check it with your revenue. Moreover, you can use this for project cost projections and tax preparation. Fast purchase processing. Purchase orders can also be automated to lower purchasing costs through Sage Intacct. With this, you can process credit cards and bills without the need to buy a third-party application for the task. Moreover, you can streamline and simplify online transactions effortlessly to boost customer experience. Roles & permissions. Sage Intacct segregates user permissions for security purposes. This can limit a user’s ability to move within the software, blocking various features and actions. Due to Oracle’s reliable database system, the information within the software is safe from external threats. The first association of Odoo in the finance world is the one of a perfected, yet open-source ERP system. Despite of what you’d expect from a tool you don’t have to pay for, Odoo packs all necessary sales, accounting, POS, inventory, and project management features into a compact unit, and lets you manage your business in a way that is most suitable for you. Developers also took care of connectivity, and helps you grow your potential by bring in and utilizing data from other systems. The platform will even offer a free-to-use website builder for ambitious retailers, an integrated MPR kit for PLM and maintenance, a variety of email marketing features, and a fully-functional help desk for your customers. Odoo is also one of the few financial management tools that supports e-signing of agreements and financial documents. What is unique about Odoo? Management of various business operations. While offering a free plan for its customers, Odoo is powerful enough to facilitate multiple business processes, Whether you need an HR system, an inventory management software, or an accounting tool, this software is the answer to your problems. What’s even better is that it can work seamlessly with other software ecosystems. Modular Architecture. In itself, Odoo offers plenty of functionalities to reinforce your operations. However, its developers did not stop there. They built the system to support multiple modules so that users can easily extend its capabilities and configure it according to the changing needs of their business. Lowered TCO. Unlike on-premise ERPs, Odoo’s cloud-hosted architecture frees users of the responsibility of maintaining, repairing, and updating the system on their own. The vendor can easily provide you with system upgrades, bug fixes, routine checks, and the like to make sure that your program is in tiptop condition at all times, ultimately guaranteeing uptimes and lowering TCO. A free basic plan. Completely cloud-based, Odoo can be used completely for free by teams with up to 50 members. This is inclusive of all the essential ERP features you require and can support third-party applications for complete configurability. With that said, this makes it a great option for companies who have yet to have the funds to invest in advanced ERPs. Flexibility. Customer demands, industry regulations, and market trends change constantly, so you need to make sure that you are agile enough to adapt to these quickly. This is why Odoo provides a highly configurable interface and modular architecture that will help you alter its functionalities depending on your current needs. FinancialForce ERP is another product on the ‘don’t miss’ list that integrates with Salesforce CRM, emphasizing in such way the importance of managing finance and customers interdependently. It is entirely focused on the time- and cost-efficiency of your business processes, it manages and captures all relevant customer information, and keeps you on top of all meaningful market opportunities. With record uptimes and a very reliable support team, FinancalForce is equally beneficial to sole professionals and finance teams, which also get to collaborate,montior progress, and share information across departments. Hosted in cloud, FinancialForce ERP will not only promote your business goal and bring the best out of ERP in your hands, but also offer unparalleled flexibility for you to retain control over your success. Integrated system. FinancialForce ERP is built on the Salesforce CRM platform. Because of this, you can make the most out of the functionalities of both systems and use them to boost operations. This is especially useful for those who are already using the Salesforce system for their business. No-coding customization. Not all businesses have their dedicated team of technical experts and not all business owners have the expertise to program their software. If this is the case for your company, FinancialForce ERP will be a boon for you. It has a low-code architecture that lets you customize your system quickly using a drag-and-drop interface. 5 compact (and independent) productivity modules. Utilizing one system for multiple processes is an efficient way to manage your operations. This is why FinancialForce ERP is composed of different modules that tackle finances, human resources, ordering and billing, service automation, and supply chain management. With this, you no longer have to spend on multiple platforms for your business. A robust suite of financial management features. Most businesses dedicate a huge chunk of their time to keeping tabs on their finances. To help you accelerate the process and give you the time you need to run your business, FinancialForce ERP offers robust financial management features that tackle everything from invoicing to revenue recognition. Extensive billing features. Aside from its financial management system, FinancialForce ERP is also equipped with tools that let you manage billing and ordering in the same platform. With this, you no longer need to manually reenter data into a separate billing system, saving you time in the long run. Epicor ERP was created for ambitious manufacturers looking to keep up with technology advancements and entrust data to a system that will evolve with it. The platform masters in combining enterprise resource planning with industry highlights and achievements, which makes it pretty much the only ERP tool utilizing IoT, big data analytics, and 3D design automation in the service of your success. You can use it to enhance visibility across your entire supply chain, boost profitability with custom business intelligence, and respond to market changes quickly and decisively. The platform’s sales management capabilities will also be of great use to develop profitable products, minimizing risks, and promote accountability with little to no investment. What is unique about Epicor ERP? A system that evolves with your business. Epicor ERP is designed to heighten customer expectations and support emerging technologies, and integrates big data, the Internet of Things (IoT), mobile, social, and 3D design automation for you to make fully informed business decisions. Compact manufacturing and fulfillment management. Epicor ERP enables you to respond to challenges quickly and decisively, by pricing products accurately, and for maximal profitability and customer satisfaction. For the purpose, it offers a fully-equipped business intelligence dashboard, and a variety of methods for increasing bottom line and profit margins. Greater accountability. Epicor ERP promotes greater accountability and minimizes risk with integrated supply chain management feature. It also leverages powerful IoT remote service capabilities to keep service costs under control. Growth opportunities. A distinctive advantage of Epicor ERP compared to similar systems is the possibility to accelerate the digital transformation for your business. This platform gives you a clear overview of market opportunities, as well as the chance to reach out to new audiences, expand product lines, and improve the position of your business both in the industry and your country. Enterprise content management. Rather than focusing on your manufacture and production resources, Epicor helps plan and manage documents and content, both from traditional and mobile devices. It will help you store, organize, manage, retrieve, and reuse important data, and prevent it from falling into the wrong hands. WorkWise ERP combines 8 customer management suites and even 45 essential manufacturing control applications (for example: product configuration, engineering, mobile metrics, capacity requirements planning, shop floop control, CAD integration) for modern businesses. This makes it pretty much the one-stop-shop for ambitious ERP shoppers and growing manufacturers who also get to deploy it as they wish (on premise or in cloud), and to activate it as their single sales, marketing, and customer service app that also handles product engineering, finance control, document management, and business analytics. At the same time, WorkWise ERP is easy to use, scalable, and configurable, and fully optimized for mobile and out-of-office operations. What is unique about WorkWise ERP? Designed for manufacturers. WorkWise ERP targets exclusively developing and ambitious manufacturers interested to respond to the various market challenges in their industry. The solution is smart, fast, and very scalable, and offers all production-to-delivery features (make-to-stock, engineer-to-order, build-to-stock, configure-to-order, assemble-to-order, mixed modes, jobs hops, and more). Unparalleled diversity. At the moment, WorkWise ERP offers 8 suites and 45 manufacturing applications, including unique ones such as shop floor control, CAD integration, capacity requirements planning, visual scheduling, mobile metrics, and more. Role-based ERP technology. What experts also appreciate about WorkWise’s ERP solution is its role-based architecture which replaced traditional, modular approaches and general ledger modules. The system uses WorkBenches, which are in fact dedicated views developed to match the roles and permissions of each member, and allowing them to configure each segment of their work. Fully-featured CRM. WorkWise pairs its popular ERP solution with a functional CRM suite, making it possible to align production to customers’ exact needs and expectations. From quote-to-delivery, you will be able to follow, assist, and engage customers, and automate your leading sales and marketing operations. Expert implementation. Despite of being an easy to system to learn and implement, WorkWise ERP assists prospective users while installing it. During this process, you will work side by side with skilled consultants and professionals, and have the system fully adjusted to your needs. Microsoft Dynamics NAV is a powerful and well-reputed ERP solution that caters to the manufacturing needs of midsized businesses and organizations. The core of its functionality is financial management, but the system can also be applied to cover for your sales, project management, human resources, and Web intelligence requirements. Its flexibility and customizability makes it desirable foremost in vertical industries, where users would get a large list of industry-specific configurations to adjust it to their needs. The platform can be deployed on-site, or acquired and maintained in cloud for a slightly higher fee. What is unique about Microsoft Dynamics NAV? All-in-one financial management solution. With Microsoft Dynamics NAV, you will get a single system that can manage all your accounts and finances, control your supply chain and manufacture operations, govern the sales and service you provide to customers, and manage your project-based activities. An international system. Being a Microsoft product, Dynamics NAV intends to help you expand your reach and target new audiences. To do so, it offers support for various languages and all leading international currencies. In-depth analytics. To help you transform business data into operable intelligence, Microsoft Dynamics NAV gives you a comprehensive analytics and reporting kit, as well as a 360-degree holistic view of your contacts and deals. Flexible deployment. Microsoft Dynamics NAV is another of our top ERP suggestions where you get to choose whether you will have your system deployed on premise, or in cloud. Seamless integrations. The first thing you will like about Dynamics NAV is the friendly suite interface you already know, and seamless integration with all leading Microsoft products (Word, Excel, and Outlook). The system’s powerful capabilities are offered to Windows, Android, and iOS users. ERPNext is another open-source ERP solution that simplifies sales and inventory management. It targets predominantly small and medium businesses looking to manage sales, accounting, and inventory from a single platform, and it counts as one of the most customizable and developer-friendly tools in this niche. Touted as indefinitely extensible, ERPNext is easy to configure and use in synergy with third-party software, while creative users can also build personalized applications on it using the unique Frappe Framework. ERPNext is also known for reliable support, available both for local installations and cloud users, and its incredibly large user community that contributes to its innovations and developments. What is unique about ERPNext? Developer-friendly, open source ERP. ERPNext is an open source solution that pleases creative developers with an array of extension possibilities. You can customize the tool until it meets your exact business needs, add apps you already have, build apps upon it, or get any of the company’s ready-to-use Frappe Framework creations. Support for various industries. ERPNext targets predominantly manufacturers, service providers, and operators in the retail and distribution industry. Special packages are also available for schools and educational institutions. A unique combination of business management features. With ERPNext, you will have a sole management hub from where you can manage your manufacturing operations, and control finances, accounts, and invoices. A large user community. Due to its extensive presence and experience in the industry, ERPNext has a large and active user community where you can easily have all of your questions answered, or find a developer/service provider that can help you optimize the power of this system. Expert support. ERPNext’s knowledgeable agents are available 24/7 via email and phone, and also offer dedicated consultancy for novice users who are installing the system. A variety of tutorials and training materials are also available for interested readers. For many satisfied users, SYSPRO is exactly what a reliable and truly global ERP should look like. The industry-built ERP solution is oriented towards innovative manufacturers, and helps them to plan, execute, and control their production and distribution. At the same time, it puts in place professional and optimum financial management, inventory optimization, and excellence in meeting strict standards and compliance regulations. As an example, SYSPRO is often applied in industries such as food & beverage, automotive, fabricated metals, plastic & rubber, industrial machinery & equipment, and similar branches that could use some of its advanced industry configurations. Using it, you will also have access to training materials and dedicated customer support, as well as a number of professional customer success programs and services. What is unique about SYSPRO? Designed for manufacturing and distribution industries. SYSPRO’s features and functionalities were developed with manufacturers and developers in mind, which is why the tool serves foremost electronics, automotive, metal fabrication and packaging companies. Another group of common users of this system are industrial machinery producers, plastic and rubber companies, food & beverage distributors, and many more. Compact management solution for your business. With SYSPRO in your toolkit, you will have a single system that controls costs and demand-driven MRP, manages distribution, finances, risk & compliance, inventory, lean manufacturing, sales, and a variety of other vital business processes. Planning & Scheduling solution. Planning and scheduling modules are integrated in the system to empower manufacturers to quickly create and share reliable and accurate production plans. These schedules take into consideration even production constraints related to materials, machines, people, and time, and are therefore considered to be a reliable picture of the company’s production capacity. Workforce management. SYSPRO specialized also in workforce management, making it possible to collect and arrange data, track processes in real time, analyze the performance of employees, and respond instantly and actively to market challenges. Training materials. SYSPRO is suitable even for non-experienced users, as it offers a large case & content library, and a video base with demos and tutorials that can help you optimize its capacity. All of these materials are offered for free. If looking for a modern, compact, yet low-cost ERP solution, look no further than Compiere. It specializes in manufacturing and warehouse management resource planning, and it is conveniently hosted in cloud to minimize costs related to installment and maintenance. Compiere is best known for enterprise-class, multisite ERP that is highly adaptable, and often records dramatic TCO decreases. At a fraction of the usual price, users will obtain product management, order management, materials management, inventory management, financial management, and CRM features, neatly combined with business view layers and all types of standard reports. Small and medium businesses, on the other hand, get to use Compiere absolutely for free. What is unique about Compiere? Pairs manufacturing with compact warehouse management. Compiere is a fully-functional and responsive package of manufacturing and warehouse management features that makes it possible to reduce the total cost of ownership for your business, automate all manufacturing processes, and improve productivity. Multisite ERP. Compiere is best known for multisite ERP, as a unified and cost-effective platform that packs warehouse management, manufacturing management, materials management, purchasing management, CRM, Slaes & Web store, order management, and global financial management. E-Commerce. With Compiere, users can create and run beautiful and functional web stores, control valuable customer relationships, and manage all of their sales operations. The system is also suitable to manage the entire service delivery lifecycle, and offers a 360-degree view of all customers. Suitable for all users and geographies. At the moment, Compiere serves a large number of companies and organizations in the distribution, retail, manufacturing, publishing, healthcare, pharmaceutical, government, and non-governmental sectors, located in over 40 countries worldwide. This means that it is suitable also for large and global organizations which work with multiple currencies, and adhere to several different tax laws and accounting standards. A variety of deployment options. With Compiere, it is you that choose which software capabilities you’re about to obtain, and how you’re about to deploy them. You can buy a licensed version of the software and deploy it in your own data center, or opt for cloud-based deployment using the Amazon Elastic Compute Cloud (EC2). Priority Software serves the manufacturing, retail, wholesale, financial service, logistics, agriculture, healthcare, construction, pharmaceutical, automotive, fashion, software industry, and the government sector, delivering an all-in-one ERP solution for smart production and distribution. Compared to similar manufacturing-friendly ERP solutions, Priority Software attracts attention with dedicated commercial features, superior SaaS and on-premise technology, rationalization and flexibility, short implementation, and over 30 years of experience and great reputation. The system is priced by quote, which means that each client receives an individually tailored plan that meets his needs and payment capacity. What is unique about Priority Software? Meets the needs of various industries. Priority Software is designed to meet the exact needs and requirements of multiple industries, including retail, manufacturing, financial services, wholesale, logistics, healthcare, agriculture, construction, pharmaceutics, medical devices, automotive, software, fashion, municipalities, and professional services. Advanced technology. Priority Software is available both in cloud (SaaS) and for an on premise installation, depending on what they user prefers. It requires no set up and maintenance efforts, and offers fully-functional mobile apps for Android and iOS users. Easily adjustable. This system is available in several different languages and support all leading currencies, which means it can handle any type of transaction, wherever it may take place. It is flexible, scalable, and offers multiple rationalization options that can make it work in your industry. Lower TCO. Priority Software’s innovative commercial and operational model makes the system very cost-effective. According to the company, with TCO up to 70% lower than comparable ERP systems, Priority Software is a great solution for on-budget and developing companies. Access to training materials. Visiting the company’s Help Center, you will discover a number of tutorials and training materials that can help you optimize the effects of this system at absolutely no charge. Due to the system’s 30 years of experience in the industry, you can join a large community of users and ask for assistance. Inventory control with Acumatica enables you to seamlessly manage and track all your inventory items. It ensures that you are never out of stock and your business keeps on moving smoothly. Especially for retail and service companies, inventory control module can be a life saver. The software addresses in particular the needs of service industries, manufacturing, wholesale distribution, retail and commerce, healthcare, telecommunication and many others. It’s a fully integrated software service bringing all your business details at one place. An important advantage of this system is its analytic power – through intuitive reports and analytics, Acumatica will monitor your business performance and take safer and more productive decisions based on facts. What is unique about Acumatica? Workflow automation. Having consistent workflows in your workplace is crucial to ensuring quality products and services. However, this is difficult for those who manage multiple offices or stores. To help you streamline everything, Acumatica lets you control and monitor all your operational workflows in one convenient platform. This way, staff members from all your businesses are kept in the loop about your processes. Extendable, and suitable for different industries. Acumatica is also a very flexible system designed to target several different industries. It allows its users to configure it according to their changing needs using integrations with third-party applications, widgets, and extensions. Comprehensive inventory control. Inventory control with Acumatica enables you to keep your stock levels in check at all times. In such way, the system ensures that you always have an ample amount of the materials you need for your day-to-day operations. This is a feature that is particularly useful to retailers and service providers. Intuitive analytics. You don’t have to be a BI specialist to understand the data Acumatica provides. This system has one of the most intuitive and user-friendly analytics & reporting kits that lets you make sense of your business performance data, optimizing your decision making process. Cloud-hosted. Being entirely cloud-based, Acumatica will work on all devices, browsers, and operating systems. This means that you can complete your tasks and access business information 24/7, and keep an eye on progress wherever you may be. IQMS is another manufacturing-exclusive ERP solution that provides full control over all aspects of the manufacturing operation, be it front-office or back-office tasks. You can use IQMS to replace multiple independent systems in your company including preventive maintenance, asset management, reporting real time, MRP, and more. To cut down consolidation costs and eliminate report inconsistencies, IQMS integrates seamlessly with Oracle Database, Microsoft Office products, and many more leading third-party applications. The system is hosted in cloud (though on-premise version is also available), and requires no implementation or training. What is unique about IQMS? Manufacturing-first system. The IQMS solution is designed to solve all main manufacturing challenges, and it will thus help you increase your efficiency, eliminate unnecessary downtime, enhance manufacturing production and performance, and improve supply chain visibility. Seamless integrations with Oracle and Microsoft office. Once installed, IQMS becomes a single point of contract for all operations and technical support. You will recognize an embedded Oracle database that helps update transactions instantly, and make them visible through the system in real time. The tool is also well-connected to Microsoft office products, and offers an open API infrastructure for you to build custom integrations. Best-of-breed MES. IQMS helps depict and fix critical issues in the manufacturing process. Using it, yo won’t have to rely on multiple points of software support, or pay high maintenance fees. Instead, IQMS will regulate multiple databases in a cohesive system architecture, and unite data coming from various sources. This way, you will never have to worry about aligning inconsistent updates, approaches, and strategies. Reduced costs. You can use IQMS to replace multiple independent systems in your company including preventive maintenance, asset management, reporting real time, MRP, and more. The system is intuitive and can be utilized even by lay users in your organization. Quote-based pricing. IQMS’s pricing plans depend on the exact needs and requirements of the user. To get a custom quote, you should contact the company’s sales team or make a direct request on their website. QAD is a global manufacturing ERP solution that addresses specific industry needs, and offers quality CNC grinding machines to help you build an efficient enterprise. The cloud-hosted, no-risk resource planner is flexible and simple to use, an provides a variety of valuable insights that help you predict production and remain prepared for all market challenges and opportunities. What experts appreciate the most about the QAD suite is its ability to run complex, mission-critical applications with 99.5% uptime, being at the same time fully cloud-independent, and able to meet customers’ evolving needs over time. In such way, QAD Cloud ERP converts regular users into effective thinkers and designers, helping them employ a user-centric research, and building a system that covers their most exclusive and specific needs. What is unique about QAD Cloud ERP? An ERP system for manufacturers. QAD gives manufacturers the agility they need to change processes, integrate acquisitions, introduce new products, and meet the exact requirements of their customers. To do so, it offers intuitive planning tools, built-in management features, product genealogy, production scheduling, lean manufacturing, quality management, and many other functionalities. Demand control. QAD gives you full visibility into your global supply chain, and helps drive margin, lower costs, and reduce lead times. Using it, you will have access to demand planning, sales and operations planning, distribution planning, and production planning that corresponds to the requirements and capacities of your organization. Supply chain execution. With QAD, you can easily plan, manage, track and record costs associated with the transfer of items between sites. The system will also offer a compact shipment supplier portal, package exception management portal, and a variety of release and freight management processes. Customer management. Another area where QAD excels is customer satisfaction, as this system uses an array of collaborative features to improve responsiveness at all stages of the customer’s lifecycle. You will get a dedicated order & invoicing portal, 360-degree view CRM kit, a web-front self-service portal, and trade activity management features. Financial management. QAD doesn’t focus solely on ERP operations, but rather keeps a close eye on how you manage your finances. It is a popular solution for international finance management that offers multi-GAAP, general ledger transactions, allocations, accounts payable/receivable, credit management consolidation, and budgeting control. Akshar School Solutions is primarily a school management software designed to make student and staff management a breeze. Moreover, it unifies all your processes under a single roof, enabling you to optimize your processes, better maximize resources, and provide a better experience for learners. All finance-related tasks are streamline thanks to its built-in finance hub, which gives you complete control in managing finances on student tuitions, school expenses, and staff wages, among others. Akshar School Solutions also bridges the communication gap between school and parents through a parent portal where they can keep track of their child’s progress and effectively communicate with teachers. What is unique about Akshar School Solutions? Finance hub. Stay on top of all your school’s finances with tools for school expense tracking, student payment reports, staff wage management, purchase orders, and much more. Coupled with its custom reporting tools, you can use your raw data to make informed decisions in improving your management and strategies. Automated workflows. Akshar School Solutions automates finance-related workflows, thus eliminating the need for manual computations. Because of this, users can benefit from less instances of human error. Message hub. Stay connected with key individuals, most especially to parents. Easily communicate with parents using Akshar School Solutions.